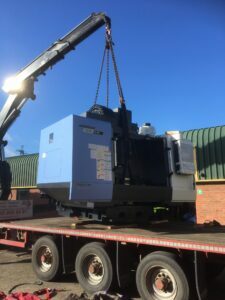 Demand for CPL services continues to grow and in order to support our prestigious client base we have recently acquired two new high performance milling machines. In February this year we took delivery of a new Haas UMC 750 5 axis Vertical Machining Centre to expand our production capability. With its 500mm integrated 2-axis trunnion rotary table, 40+1 side mount tool changer, 30.5 m/min rapids, spindle orientation, coordinate rotation & scaling, Wireless Intuitive Probing System, power-failure detection module, and 284 litre flood coolant system, the Haas is a state-of-the-art machine. Last week we had a new Doosan DNM 6700 delivered, this machine will further increase production capability. It is equipped with powerful direct drive spindles, large working envelopes and with the incorporation of thermal error compensation systems, roller LM guide-ways with grease lubrication and quick-change ATCs increase productivity and process reliability.